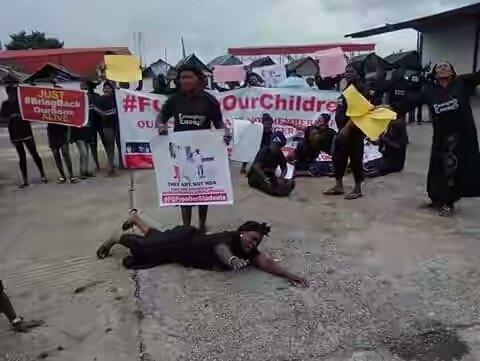 Women of Gbaramatu Kingdom, Warri South West Local Government Area, Delta State, have carried out a peaceful protest in Warri, calling for the release of the 10 students arrested and detained by soldiers, over 47 days ago, when they invaded Oporoza on grounds that they were militants. 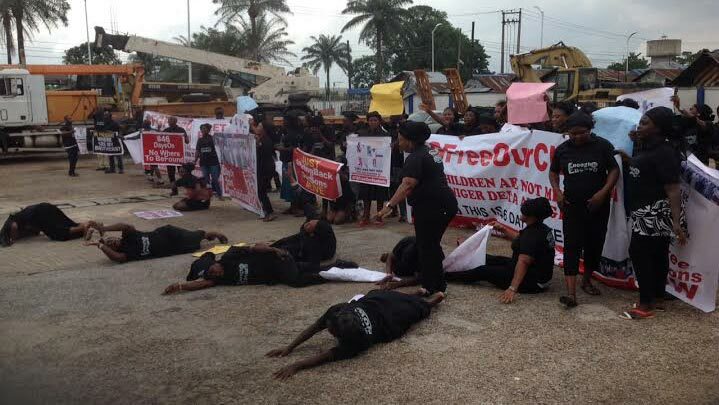 The women joined by the National Association of Gbaramatu Students, NAGS, gave the Federal Government a one- week ultimatum to release the students, threatening to march on the Presidency in Abuja if the students were not released. 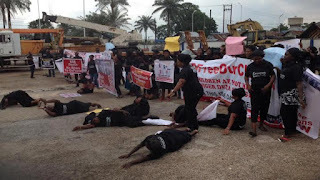 The protest came as the Ijaw People Development Initiative, IPDI and Ijaw Human Rights Monitor, IHRM, decried the continued detention ‎of the suspects without trial. Placard-carrying Gbaramatu women led by Chief (Mrs.) Vero Tangnowei chanted solidarity songs calling for the release of the students. The protesters accused the military of arresting, framing and taking the 10 students into custody under the guise of being militants for more than one and half months running. She debunked the claim that the 10 arrested ‎students were members of Niger Delta Avengers, noting that they are students of Gbaramatu Grammar School, Oporoza as well as stewards to the Gbaramatu Traditional Council. Mrs. Endurance Oyatiedei whose 17-year- old only son, Friday, was among the suspects, ‎said her son could not write WAEC examination because of the arrest and appealed to President Muhammadu Buhari to release him. Mrs. Ruona Odiki expressed sadness over the invasion and detention of the Gbaramatu Students, including her brother-inlaw just as she appealed to the Federal Government to ensure the safe release of the 10 students. The 10 Gbaramatu students allegedly arrested 47 days ago during the military invasion of Oporoza include were Ebi Emma (SS1 Student, Gbaraun Grammar School, Oporoza),Philip (Palace Cook) Andrew (Palace driver) and Tebe-ebi ( Palace tailor). Others were Emotimifagha (student of Gbaraun Grammar School, Oporoza) John (Student of Gbaraun Grammar School, Oporoza) Solomon teiwei (Student of Gbaraun Grammar School, Oporoza) Oromoni (Community boy) ,God’spower Abraham (Student of Gbaraun Grammar School, Oporoza) and Bright (mechanic). National presidents of IPDI and IHRM, Austin Ozobo and Fred Brisibe respectively, said the arrest of innocent students by government indicates intelligence failure on the part of government, while their continued detention without being charged to court showed its impunity and unwillingness to resolve the matter.